Hi Seb, please introduce yourself to the Isratrance readers. Who are you, where are you coming from and where are you going? 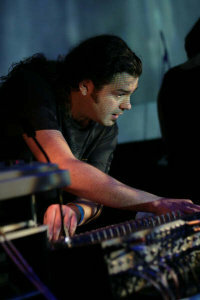 Seb: Well from a musical perspective I guess I’m originally coming from a guitarist point of view, then having very much been part of electronica & rave culture (especially the psytrance scene between around 1996 & 2004) and ended up working with world music & orchestral instrumentation! Who knows where I’m going musically? Maybe a combination of all of the above influences? As long as I’m inspired by music I’ll always be creating it. Actually, I have to admit that I find it hard to get enthused about much outside of the creative realm. Art, Music & Photography excite & inspire me much more than anything else in the day to day world. It’s all about the creative process for me. Why did you choose the name Hibernation for this project? Seb: Well, because that’s what I love to do. Hibernate away in the studio & avoid the outside world as much as possible, ha ha! Actually, when Aleph Zero were searching for tracks for a winter themed compilation, that’s how I came up with the first ever Hibernation track, which I called ‘Hibernation’. The winter theme compilation didn’t happen in the end, but that first Hibernation track is now soon coming out on the Natural Born Chillers 2 compilation. How and when did you discovered psytrance and ambient/chill out music? 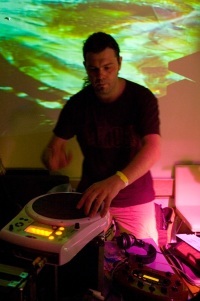 Seb: The first act I had was Digitalis, and I used to gig at a club called Spacehopper in Birmingham, UK. That was the first place I heard the terms Goa trance& psychedelic techno. I wasn’t really making that sound myself at that time, the Digitalis stuff was much more influenced by Breakbeat & Techno, and as a result my sets always stood out in that club… it was something different. The other DJs at Spacehopper were people like Tristan, Tsuyoshi Suzuki, Sid Shanti, Mark Allen, James Monro etc., so even though I wasn’t making psytrance, I was very much within that world. The natural conclusion of being around the trance scene in those early, vibrant years was a side project called Shakta, which quickly overtook my other projects. When Shakta got exclusively signed to Youth’s label- Dragonfly- I was suddenly gigging all over the world & meeting amazing friends in far flung locations. I’d never even been on a plane before that! Crazy Times. My entire musical life & direction definitely owes a lot to those early days in the trance scene. What is on your CD Player right now? 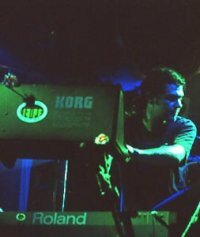 Seb: While I was finishing up these latest 2 albums (Kaya Project & Hibernation) I didn’t listen to much other music. But now they’re all finalized & mastered I’m staring to absorb some outside influences again. Most recently I’ve been listening to Beck’s ‘Modern Guilt’, Burnt Friedman’s ‘1st Night Forever’, quite a bit of dubstep from people like Elemental, Ital Tek & Burial, and a few assorted movie scores from people like Thomas Newman & the like. Which one of your own music do you like the most? Seb: I always tend to like my most recent stuff much more than any previous compositions. I guess because it’s always more relevant to my current life and usually reflects my current state of mind and emotion better than my tracks from yester-year. Sometimes if I listen to much older tracks of mine, they often feel as though they were written by another person. Without doubt my favourite releases are the latest Kaya Project album & the debut Hibernation album. In my opinion they are the best music I’ve ever produced, but I’m sure other people might disagree! Ha ha! From a personal point of view I’m also very happy with the music I composed for the BBC last year. It was a fusion of Orchestral Battle Pieces & Traditional Japanese Music. Quite a challenge, but I really enjoyed making that music and was extremely happy with the end result. You released a lot of good music through different projects and by different labels. Why are you making electronic music? Seb: Making music is my sole driving purpose in Life. I feel like I’m doing exactly what I should be. I’m always trying to follow my heart when it comes to music. 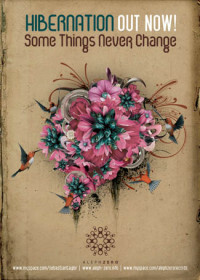 What do you think about your new album “Hibernation - Some things never change” released on Aleph Zero Records? Seb: What do I think of it? Well, it’s probably more interesting to see what other people think of it! It was in the pipeline for such a long time that I’ve probably heard the tunes far too many times to be objective about it (It’s always hard to judge your own work after all). But ultimately I’m very happy with the final album. There are styles of music in there that I hadn’t really experimented with before, and it was important for me to steer away from many of the clichés that have arisen within the scene. I hope that makes for a more interesting album, but like I said, it’s probably not for me to judge my own creations! It was important for me to make sure it was distinct from the Kaya Project sound. So it’s extremely electronic (which in itself is a pretty open-ended medium) and there are textures & sounds that I wouldn’t put into my other projects. 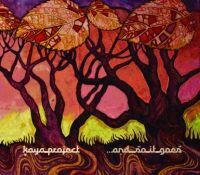 The 3rd Kaya Project Album “..& so It Goes” is really a refinement & development of the sound from the first two albums, albeit a lot more acoustic & real, whereas the Hibernation Album is a totally new sound for me to produce. It’s going to be interesting to see where the Hibernation sound goes with this album as the starting point! Aleph Zero designed a very good looking Hibernation e-flyer. What do you think of using the internet as a promotional tool? Do you have a myspace page or a webpage? Seb: Some artists are better than others at the whole self promotion game, but I’d much rather be the guy in the background, just getting on with making the music. That might sound odd coming from someone who’s spent a great deal of time on stage over the last 12 years! But that’s how it is for me these days. I don’t have a website but I do have a myspace page and that has led to some great musical connections and discoveries. The Internet has been an amazing revolution for people like myself. Really amazing. I currently produce music for a number of production companies in London, Los Angeles & Canada, never having met any of the people and in some cases never having spoken to them either! It’s a real cyberspace method of working, files & emails being zipped across the planet in milliseconds and I don’t have to leave the studio from the start of the project to the end. I don’t think anyone could have imagined that being possible way back in 1994. But as for the Hibernation e-flyer, yes, it’s great! I’m lucky to have the Aleph Zero team on the case when it comes to promotion. I’ve always admired the artwork and concepts of previous Aleph releases so to have that touch added to my music is a great partnership. How it is to work with other musicians? Seb: I do work with quite a lot of other musicians in my world music projects (Kaya Project & Angel Tears) but generally I prefer to work alone. I enjoy that isolated creative zone where you don’t have to talk or communicate anything to anyone. It’s all about connecting directly with the music. When I’m in that mode (which is most of the time) the phone never gets answered and people know that email and text message is the quickest way to reach me. I guess it’s like being some kind of musical monk! Ha ha! Not speaking at all, just meditating on the creative process and tapping into your inspiration. That’s not to say that I haven’t experienced some great collaborative combinations in the past, for example with Momi Ochion on the Angel Tears material, and of course with Natasha Chamberlain on our Foxglove & Kaya Project tracks..… I’ve also always found it easy to work with Billy from Cosmosis as well, but generally speaking I’m a musical Hermit. ‘One-man-band’ kind of thing. Seb: No thanks. I’d always much rather create it & appreciate it than analyze it. What equipment you have at your studio? You think hardware is important to achieve unique sounds, or these days with the right software you can do most sounds you want? Seb: I really don’t have much hardware at all these days. When we traveled the globe for a year (recording the second Kaya Project Album) I lent all of my equipment to friends to look after and use until I returned. That was 4 years ago and the equipment is still with my friends! I simply didn’t ask for it back. Just started to work ‘in the box’ as they say. I’m starting to feel like I’d like to get back into using some proper analogue gear again. I have no doubt that analogue sounds better and warmer (even though some of my producer friends believe there’s no audible difference!). But there is something to be said for the ultimate convenience of working entirely in the computer, especially for musicians like myself, who have something like 50 unfinished tracks on the go at the same time! That simply would not have been possible in a hardware only environment. If I was working on only one project and one style of music then it would be more likely for me to return to an analogue hardware setup, but I have many different styles of music on the go and always need to be able to totally recall everything. I also produce a lot of music to very tight deadlines these days, so the instant recall is invaluable there as well. Do you have any preferred time to play at parties or festivals? Seb: I going through a relatively gig-free phase at the moment and don’t really accept many bookings. But in the past if I’ve been booked to play a festival I’d usually prefer to play a night-time set, preferably at the beginning of the festival. The main reason I ask for nighttime sets is to avoid the heat! And asking for an early (i.e. - beginning of the festival) set usually means that I can relax after my set(s) and enjoy the rest of the festival. But these days I turn down the majority of gig requests. The last festival I played at was the Cairns Winter Solstice in Australia. I played Hibernation & Digitalis DJ sets & a Shakta live set & DJ set. It was a great festy, but nevertheless, it will probably be a while before I start regularly gigging again, time will tell on that. I’ve been doing a few Digitals Breaks DJ sets & also some occasional retro Shakta sets, but there just seems to be far too many things I want to work on in the studio at the moment. That’s always where I’d rather be putting my creative energies. Any last comment, message and/or promotional link?